You are here: Home / Uncategorized / Kitchen Cabinetry – What do Buyers Want? Kitchen Cabinetry – What do Buyers Want? Do: Choose quality hinges and runners, including soft-close drawers, and custom-made cabinetry. Don’t: Go for large fillers and ill-fitted modular cabinetry. Do: Keep the wall cabinetry sizes the same where possible. Drawers look nice when they are large and expansive – if you have multiple sets, keep them the same size, with the same proportion of drawers. Don’t: Add multiple cabinets in varying sizes. Try to keep the look and feel consistent in the whole space. Do: Keep the space open, bright and light with white cabinetry. If you want some contrast, go for a darker bench top. Backsplashes should be kept fairly neutral too – try to introduce texture instead of color into the backsplash. The more neutral and elegant the space is, the more potential buyers you will attract. Don’t: Use darker-color cabinetry, which can make the space feel closed. While adding a strong color may suit your taste, it may not be to everybody’s liking. You want to attract as many potential buyers as possible, and while white may not be the most daring color for your cabinetry, it’s the most popular. 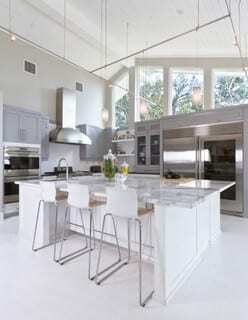 Do: Have a large open-plan space with a kitchen island if possible. Buyers often want to multitask in the kitchen. They want to cook, have their kids do their homework and socialize in it. Don’t: Place your kitchen in a small and poky room. The kitchen is now often the hub of the house, and buyers want to see a kitchen that is interactive and sociable.